Mobile Mondays! 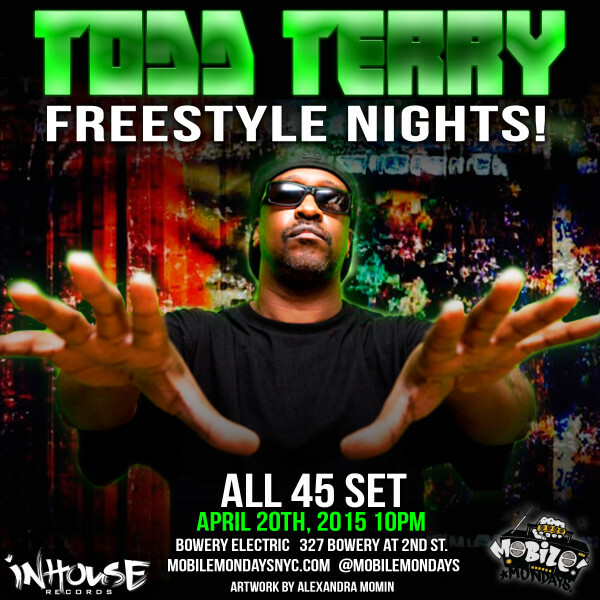 Todd Terry – Freestyle Nights! 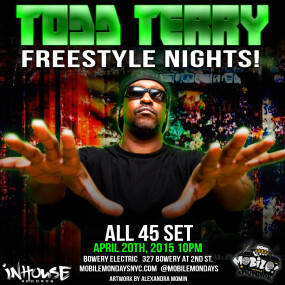 Join us 4/20 as Todd Terry spinnings strictly Freestyle 45’s! MOBILE MONDAYS!!! We are ….Punk Rock, New Wave, and Soul, Pop Music, Salsa, Rock and Roll, Calypso, Reggae, Rhythm and Blues, Disco and anything else classic and danceable -all on 45 RPM singles. Come Rock with The Mobile Mondays! All Stars – Operator Emz, Joey Carvello, Natasha Diggs, Just Blaze, Misbehaviour and $$$ Mike play 45’s ALL NIGHT !!!!!! It all goes down on Monday Nights at The Bowery Electric – 327 Bowery at 2nd Street !! in the heart of NYC’s EAST VILLAGE !